students grow in faith, knowledge, and service. 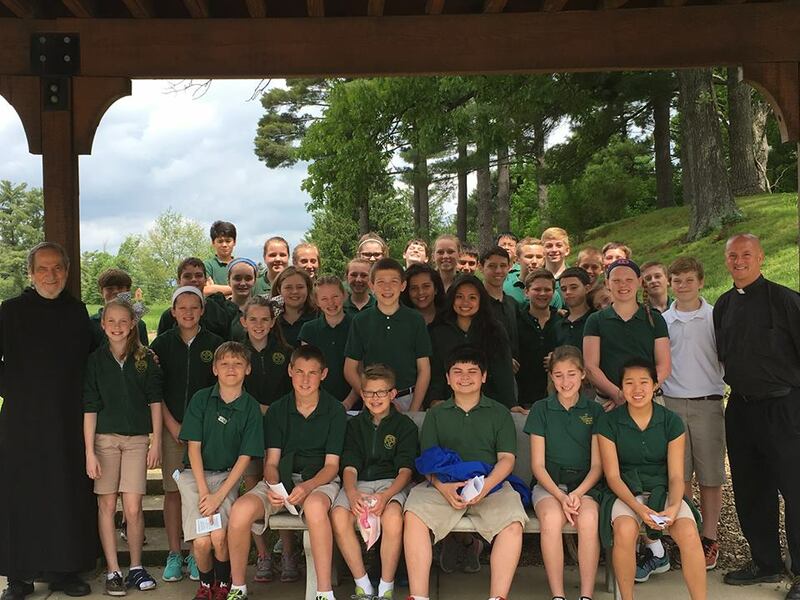 Good Shepherd Catholic School is integral to the parish’s teaching ministry. Its mission is to provide a Christ-centered education in which students grow in faith, knowledge, and service. The class day begins at 7:30 a.m. and concludes at 2:30 p.m. Students follow a uniform dress code that reflects values of equality and individual dignity. Here, children in grades K through 8 grow in knowledge, self-esteem and faith as they prepare for the challenges of the future. Their Christian development emphasizes selflessness and community outreach. Faith formation includes daily religious instruction and participation in weekly all-school Masses and liturgical celebrations. Students also share in the Living Rosary, rosary prayer chains, and Way of the Cross. The following schools have received a Four Star School Award this year by the Indiana Department of Education. 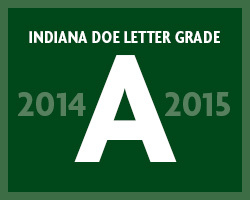 Criteria used for this recognition includes 2017-2018 ISTEP pass rates as well as an "A" rating on A-F Accountability. These schools represent the hard work and dedication of so many teachers and administrators in our diocese. Thank you!! Good Shepherd Catholic School is a Preschool-8 school with a full day kindergarten. The faculty and staff are committed to providing a faith-based environment where children are encouraged to achieve their personal best. The academic program is supported by a variety of extracurricular activities including academic teams, sports, scouts, and the arts. 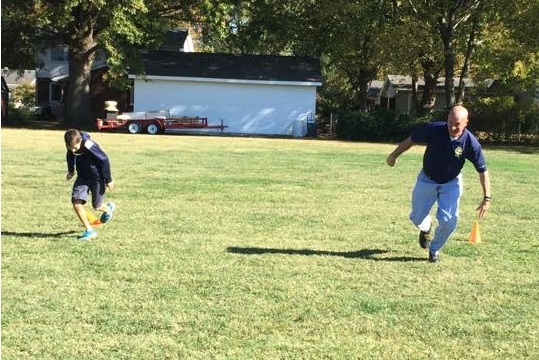 Our PTO is an active organization promoting a partnership between home and school. There is an extensive Volunteer Program for parents to become involved. Good Shepherd Catholic School is accredited by the Indiana Department of Education and AdvancED. 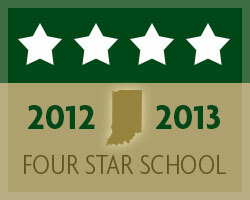 I invite you to call 812-476-4477 to arrange a tour and learn more about our school. Good Shepherd maintains a nurturing environment for students to discover their potential and develop a lifelong love for learning. The school consistently performs in the top 5 percent of all grade and middle schools in Indiana, as measured by ISTEP, the state’s standardized assessment of academic achievement. An average class size of 20 allows teachers to stay closely attuned to progress, so they can identify and answer individual needs. Each teacher maintains a web site that provides a valuable communications link for students and their parents. Online information includes homework assignments, class calendars, learning resources, announcements, teacher e-mail and student progress reports. 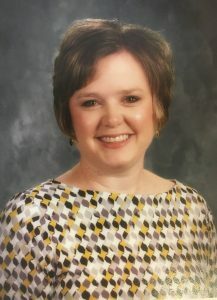 In addition, a full-time and part-time resource teacher is available for in-depth, personalized assistance. Beyond the standard curriculum, students find challenges in an accelerated reader program and academic teams for speech, math, and spelling. The school experience encourages growth outside the classroom through participation in organized athletics and programs for music, dance, scouting, and others. Investments in education bolster the vitality of our parish community. Since 1990, Good Shepherd has doubled the size of its school to serve approximately 370 K-8 students within a modern, well-equipped facility. In addition, we have approximately 20 Preschool students and 24 PreK students. 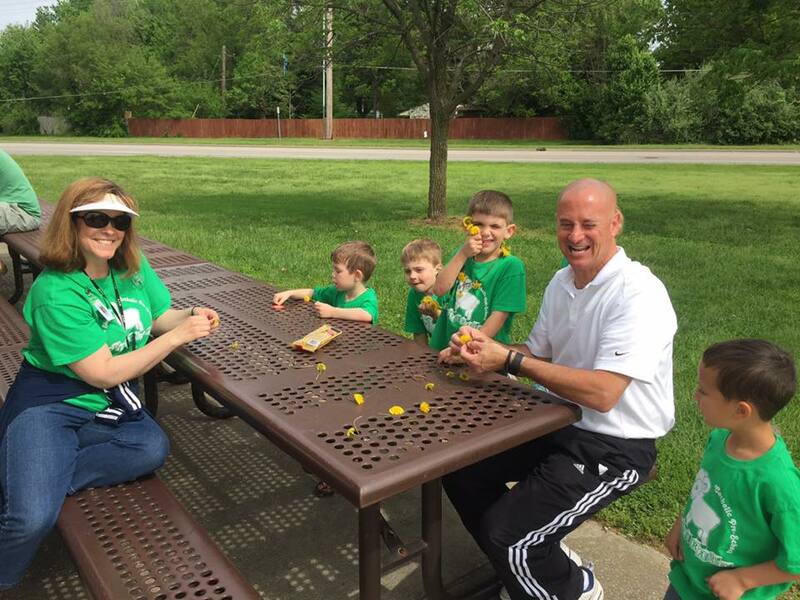 An after-school program offers working parents an option for childcare to 6 p.m.
Good Shepherd Catholic School is accredited by the Indiana Department of Education and AdvancEd; as well as, a member of the National Catholic Education Association and the Indiana Non-Public Education Association. Each year, the Indiana Department of Education recognizes schools that perform in the upper 25th percentile of schools in performance on ISTEP+ and ECA state exams, as well their rating determined by the national No Child Left Behind statute's Adequate Yearly Progress (AYP). 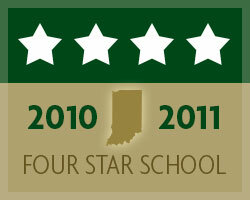 Good Shepherd Catholic School is very proud to have received a FOUR STAR Ranking from the Indiana Department of Education six years in a row! Beginning with the 2010-11 academic year, the State Board of Education changed the labels for school categories based on student performance from the terms Exemplary, Commendable, Academic Progress, Academic Watch and Academic Probation to easy-to-understand letter grades A, B, C, D and F. Starting with the 2011-12 academic year, the State Board of Education adopted the use of a new methodology for determining a school or corporation's grade, A-F. Indiana's new A-F model holds schools and corporations to higher standards and provides a more accurate picture of their performance by incorporating student academic growth and graduation rates, as well as college and career readiness, as measures of success. Good Shepherd Catholic School has received an A grade from the Indiana Department of Education every year since it's inception! 2016 - 88.9% pass rate ranked in the top 1% in the state of Indiana out of over 1800 schools. Good Shepherd ranked 4th in the state for schools that go through 8th grade. 2015 - 87.9% pass rate ranked in the top 1% in the state of Indiana out of over 1800 schools. Good Shepherd ranked 8th in the state for schools that go through 8th grade. 2014 - 97.5% pass rate ranked 12th in the state of Indiana out of over 1800 schools. Good Shepherd ranked 5th in the state for schools that go through 8th grade. One of only 7 schools in the state with a 100% pass rate in Math. 100% pass rate on IREAD. 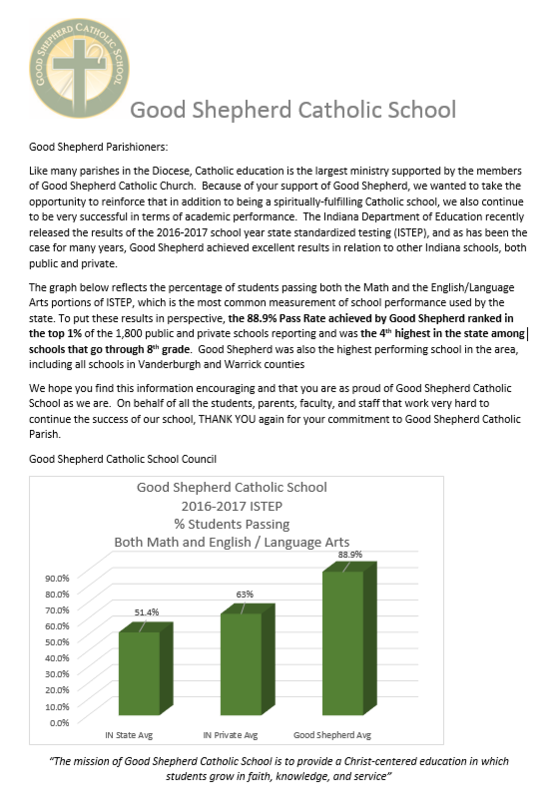 2013 - the 96.1% Pass Rate achieved by Good Shepherd ranked in the top 1% of the 1,800 public and private schools reporting and was the 4th highest in the state among schools that go through eighth grade. 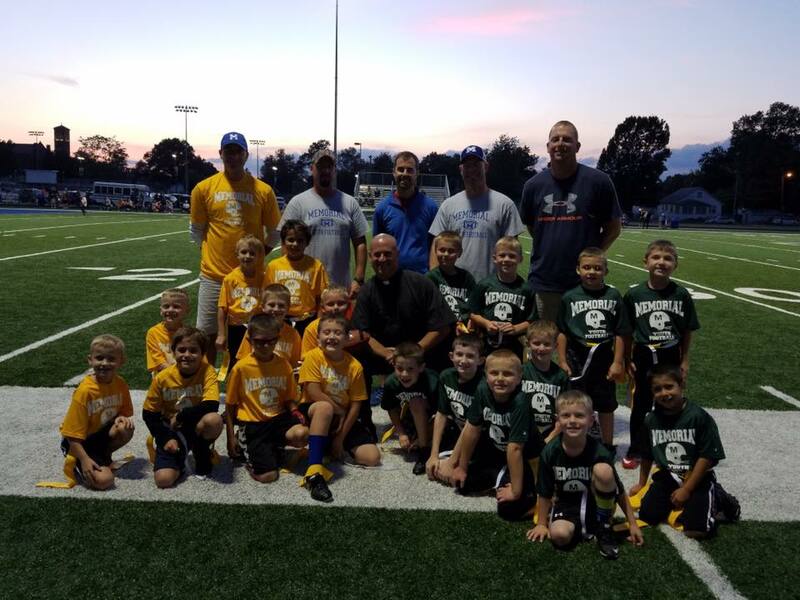 Good Shepherd was also the highest performing school in the area, including all schools in Vanderburgh, Warrick, Gibson, and Posey counties.